I recently read the book A Rowers’ Code and the message in the book has really stuck with me. To be successful, it is important to build a great team and one of the keys to doing this is creating relationships. Having a great relationship with the members of your team is key to the quality of your work. The book’s message is that your business is like a ‘boat’ and you must fill that boat with people that all want to work hard and move in the same direction for success. Most of us have been on a boat and believe me, nothing is scarier than having people on that boat that move in a different direction and start rocking that boat. You must build relationships with people so that you can fill your ‘boat’ with individuals that want to go the same direction. 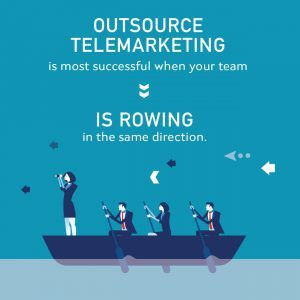 Here at Quality Contact Solutions, I am very fortunate to be part of a great team as well as having the privilege to work with many call center management teams that really know how to build great relationships and fill their ‘boat’ with the best people around! The team that I want to give a shout out to is a call center team located in DeKalb, Illinois. This team is a QCS owner-operator called CTC Teleservices. They were one of the first telemarketing agencies that QCS started working with in the beginning. They have been around for many years and have a tight knit management team. The level of communication between all members of the team is amazing and I can imagine them all in a boat ‘rowing’ in the same direction with ease. They do a variety of different types of QCS client programs and one segment that they are most successful with is membership renewals for associations. Located about 2 hours west of Chicago, in the heartland of Illinois, there are many great people that choose to join the team at the call center facility. The small city boasts many longstanding residents as well as a steady flow of college students making their home in the area. This means that there are great people to choose from to fill their ‘boat’ as well as young, smart students that want to make a good living that is flexible while earning their education. There really is low turnover, as many of the agents make telemarking a career and even the students stick around for many years while going to school. This creates a very solid foundation for success when you can keep a team together for a long time. They get to know one another and become invested in each other’s success. Clients love to hear the same voices, week after week, on their campaigns knowing that they get better with each day of calling. Membership renewals are special in the way that members really get to know the company that they have joined and they like consistency in their member care. Having a team that is invested creates that atmosphere of being one with the internal membership team and makes everyone more comfortable, thus securing more renewals each year. We can free up internal resources while still maintaining memberships for our client. A win-win for everyone! I know that I have praised the team for having long standing employees that stay with the same program year after year, but management also must create an environment that is desirable to stay in as well as provide worthwhile work to the agents, to get them to stay dedicated. Membership renewals are great programs to work on because the people that you are calling are generally happy to hear to from you. For example, one of the client programs is in the human resources field and the association members are great to talk with and that makes for a pleasant experience on almost every call. New agents are always asking to be a part of this team. In addition, the call center management team does a great job of mentoring as well as rewarding the team for making the ‘boat’ go in the best direction. There are praises posted around the call center recognizing a job well done as well as celebrating “All Stars” at the end of each month with incentives. I thoroughly enjoy working with the whole team in the DeKalb call center and am glad to have them as active rowers in the QCS ‘boat’! Having a team that is aligned and fun to work with can make all the difference in turbulent waters. If you are looking for a team that can help you achieve long term results we would love to give you a ticket to hop on our ‘boat’. We can be reached at 1-866-963-2889 or email me directly a [email protected] We will make sure you have an exciting voyage! This entry was posted in Articles and tagged Associations, Clientele, Outsourced Telemarketing on July 12, 2018 by .